VMware (New) Certification Roadmap for 2015 : goodbye VCAP, welcome VCIX! 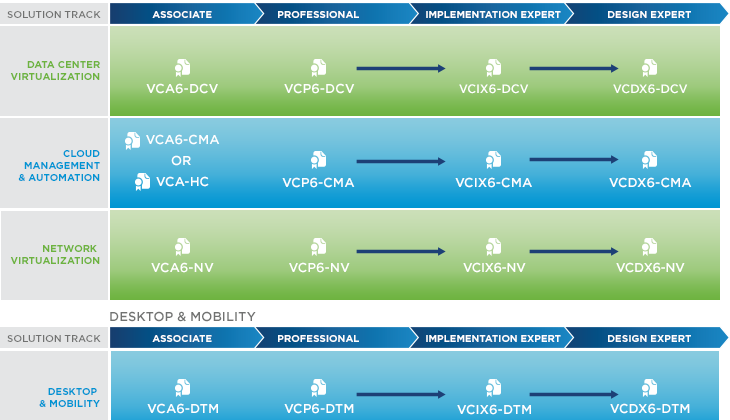 VMware has revisited the certification paths : all certification levels are affected but the major change concerns VCAP which are replaced by VCIX. The certifications are decoupled in 4 solutions tracks and 4 levels. It’s easy to notice that VCAP are missing and replaced by VCIX for all solution tracks. I don’t know if it’s a good thing or not, but this definitely change a lot for people targeting VCDX. For each VCIX certification, you will need to pass 2 different exams (see the table below). The different enhancements are listed below. Increased technology and solution areas available. Those who currently hold VCP Certification will have the option to migrate to the new version through a streamlined upgrade path. An online Foundation exam that covers the basics of virtualization and combines with elective exam to validate skills in a specific solution track. More classes, including advanced courses, will be offered that meet the "qualifying course" required for certification. Elite status for candidates who complete multiple certifications at this level. VCIX certification is comprised of two separate exams – one focused on Administration and one focused on Design. The VCIX Design exam will be available at more PearsonVue testing locations. VCIX Design exams have been shortened from 4 to 2 hours. The decreased time does not reflect ease of the exam, but is the result of the exam focusing on new topics only and does not include those covered by prior exams. Elite status for candidates who complete multiple VCIX certifications. VCDXs who want to earn multiple VCDX certifications only need to submit a new design that meets the certification requirement. No additional defense is required. Elite status for candidates who complete multiple VCDX certifications. To support a variety of career goals, a new Elite status will be available at the VCP, VCIX and VCDX levels. Elite status validates the holders’ skill and knowledge across multiple technology areas. Elite certification allows VMware to recognize those who complete multiple solution track certifications within a single level. For more information on these changes : VMware Certification Roadmap for 2015.